Lynn and Jim Ryan could never have anticipated bringing their fearful cat, Cesar, to a busy teaching hospital. If anything, the couple from Worcester, MA had always wanted to minimize the British short-haired mix’s anxiety, which would begin any time he saw his carrier. They initially tried a small local clinic to investigate the cause of Cesar’s increased urination. The clinic required only a short car ride and an even shorter waiting time. But when even the short wait proved too stressful — and the diagnosis proved difficult — they knew they had to cast a wider net. 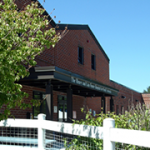 This prompted them to make their first visit to the Cummings Veterinary Medical Center at Tufts University’s North Grafton campus, where the Foster Hospital for Small Animals’ wide range of specialists and veterinary technology offered promise of a diagnosis and effective treatment for their 12-year-old pet. On the day we visited with Cesar and his “parents” at the Tufts animal hospital, veterinarian Dr. Armelle de Laforcade DVM, DACVECC happened to be presiding over the Emergency Room. Dr. de Laforcade pointed out that many pets first make their way to the Foster Small Animal Hospital after 5 p.m., when most veterinary clinics are winding down from their day. The reason why is that that’s the time many people return home from work and discover that their nagging worry about their pet’s health has morphed into something that can no longer wait. It’s especially at that hour (or later) that they turn to the teaching hospital, counting on its specialists and medical equipment that is available round-the-clock, year-round. “We have one of the largest case loads of any academic teaching hospital in the country, and it’s tricky because we have to balance providing the best patient care, the best client service and the best teaching, all of which are big priorities for us,” says Dr. de Laforcade. 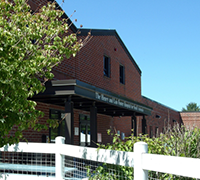 Whether an ongoing or scheduled appointment, the concern for the cat’s overall comfort begins with a waiting area designated just for cats to the right of the hospital entrance. The small room is cut off from the rest of the waiting area, reminding other pet owners to keep their dogs — and their inquisitive noses — away. Cat owners are allowed to remove stressed cats for some lap time and comforting. If that fails to calm a very anxious cat, a staff member may step in and remove the pet to a quiet exam room, providing him with a box to hide in or blankets to burrow in. Waiting is often part and parcel of the teaching hospital experience. “If you were going to your neighborhood veterinarian, you’d go in, be seen and leave, and that’s very efficient,” says Dr. de Laforcade. 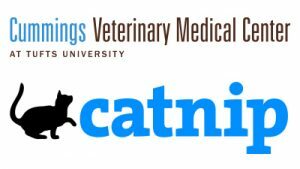 “Here, if a cat comes in to the Emergency Room, he would first be seen by a student who would get a history and then be seen by the House Officer, who is a resident — a recent veterinary school graduate obtaining specialty training. Visiting cats are treated, when possible, as outpatients. Sometimes cats are sent home with medication for the night and then, depending on testing results, may need to come back the next day for more care. When necessary, cats are admitted to the hospital and transferred to the appropriate ward for ongoing observation and treatment. On the day of the Ryans’ visit, the usual hub of activity was underway in the Emergency Room, Intensive Care Unit, Anesthesiology Unit and Intermediate Care ward, with staff conferring about and checking on patients. Cats in various stages of illness — ranging from an isolated immuno-suppressed cat to those receiving IV fluids and even a stray that a staff member had decided to adopt — are in the various rooms set aside to address varying medical needs. At work in these back rooms are faculty specialists in cardiology, ophthalmology, soft tissue surgery and more. Diagnostic equipment such as a CT, MRI, ultrasound and units focusing on interventional radiology, anesthesia, pain management, radiation oncology and critical care are all synchronized to provide the best possible care and outcome for patients, while providing instruction to students. One of the first things students learn is sensitivity to the principles of low-stress care, explains Dr. de Laforcade. In the not-too-distant past, cats were restrained in a way that allowed the work to get done by scruffing, or gathering up the loose skin at the back of their neck. But students are now taught different techniques that might work better as they start their initial encounters with patients. For instance, a cat may be able to curl up into a blanket in such a way that keeps it relaxed and makes it easier to examine. “We talk a lot about lowering stress and we do practice that, making sure to show all of our students and incoming residents how to apply those principles,” says Dr. de Laforcade. Dr. de Laforcade realizes that the hospital may seem like an unnervingly busy place to clients, and some may even fear that their cat will be used for research without their knowledge and consent, though that’s something the hospital would not do. 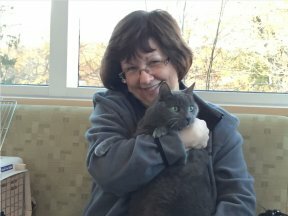 On the contrary, as a teaching hospital with faculty specialists and residents who are writing for peer-reviewed journals, the latest techniques and thoughts on cutting-edge veterinary care are at the top of the vets’ minds, and they may request permission to try a new technique. For instance, they may present an option such as offering a pill typically used for humans as a substitute for daily shots. That allows the hospital to see how well this replacement treatment works while potentially giving a client an option other than having to take a needle to their cat each day — stressful to both owner and pet. This is why the Ryans and other clients introduced to the hospital by a pressing veterinary emergency continue visiting even for routine care. “The truth is, Cesar is going to be distressed no matter where we take him because he is upset as soon as he sees the carrier,” notes Mr. Ryan, but the visits to Grafton gave Cesar a new lease on life after his diagnosis and treatment. This article originally appeared in the February 2017 issue of Tufts Catnip.